The Oberweis Concentrated Small-Cap Growth strategy captures and highlights our domestic investment team's stock selection skill over a full market cycle by investing in the 25–45 highest conviction ideas from our two domestic smaller-cap growth strategies. The Concentrated Small-Cap Growth strategy generally invests in companies with market capitalization between $400 million and $5 billion at the time of purchase. Our process rests on our firmwide commitment to uncovering and capitalizing on the persistent and recurring stock pricing inefficiencies in small-, mid-cap, and emerging-growth equities caused by a lag in investor response to new information. This lag in recognizing the catalysts likely to positively impact future earnings growth drives the security selection across all our strategies and mutual funds. The criteria used within each product, however, can differ. 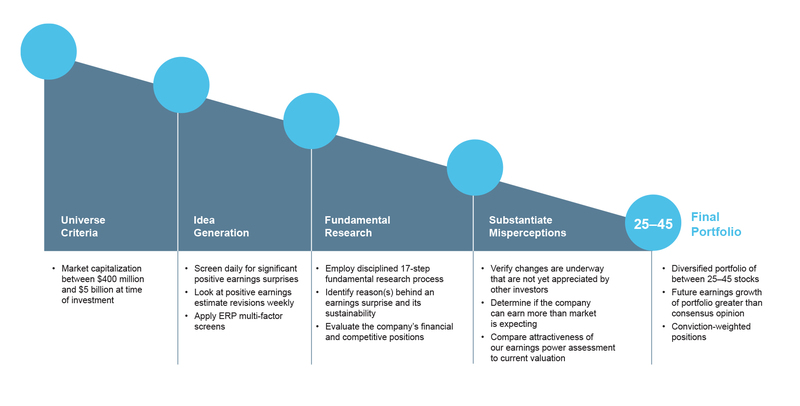 This is how our investment team implements our philosophy in the Concentrated Small-Cap Growth strategy. *OAM Concentrated Small-Cap Growth composite inception date: 4/30/02. From inception to December 31, 2010, the composite’s name was Concentrated Smid-Cap Growth.